CDs available from Mary, CD Baby and iTunes. From Aesop to Uncle Remus, stories have been a way to entertain as well as illustrate life lessons and simplify complex situations. Stories delight children and adults alike, and they enhance critical thinking and problem solving. This CD presents some favorite stories that both entertain and enlighten. I hope you’ll enjoy them as much as I do. More details and mp3 links below. •Each CD is $10.00 U.S. and $2.00 for shipping and handling to anywhere in the continental U.S. Add $0.50 shipping for each additional CD. •Prince the Frog Picture Book $10 Click here to see on YouTube and here for another Prince story. To order or ask questions, please e-mail me. To hear short snippets, click on the link for CD Baby or iTunes. Mary Garrett combines folk tales, humorous tales, and personal stories in the saga of Prince, the tree frog who spent the winter. Mary believes in the world of story and the power of story to make this world a better place. “Let’s look for tree frogs!” Coverdell Elementary students. “I love the story, and even more I love the emotion in the teller’s voice,” Kevin Young. 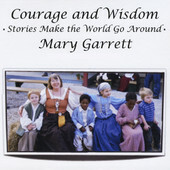 I just spent an happy hour listening to Mary Garrett’s new CD. Mary deftly weaves the story of her “adopted” frog, Prince, throughout the CD. Listeners will learn the difficulties of frog feeding in “My Frog. Prince.” Her take on “Wide Mouth Frog” is too cute. I can just see the frog with his survey clipboard. You just have to hear “Bill’s Iguana” to learn how this pet creates a Thanksgiving dinner dilemma and how he saved the family jewels! “One Wish,” “Grandmother Spider,” “Lost Purse,” and “Lightning Bug Story” add just the right combination of traditional and original tales with the perfect amount of imagination and wit. “Princess Joy,” another original story, provides a very important lesson for listeners of all ages. Way to go, Mary! Mary has given us a very rare and wonderful gift… bringing us some beautiful stories intertwined with her personal experiences with a precious friend! She seamlessly weaves in the story of her endearing little tree frog Prince with some traditional tales … you’ll hear her adaptation of Aaron Shepard’s tale More Than a Match… with an assist from some delightful little friends. Listen in to Story Lovers World and enjoy your journey from “here” to “there”! !! It’s a wise tale told so well! http://thmm.com/ksvy/ Thanks, Mary, for sharing your stories with us! To hear short snippets, click on the links for CD Baby or iTunes. All good stories contain truth, and this one actually happened. My father was my first storyteller, and I joyously carry his gift of story along with my kindergarten teacher’s gift of respect as I invite listeners into the world of make-believe. This story can be found in many variations. I have heard it as Jewish and Arabic in origin. On a flight from Istanbul, a Chinese medical student claimed it as Chinese. Stories travel light and need no passport. Riddles within riddles, and a love story. I’ve seen it attributed as Jewish or European (and I loved it on Corinne Stavish’s tape). I told this scary story at an Irish festival in St. Charles. Afterward, a woman asked if she could buy it on CD, which put this project on my “to do” list. Now if I could just find that woman . . .
Shall we live forever? Karen Chace found this story of King Solomon’s toughest judgment — a bit of perspective on life, wisdom, and coffee. The frame story of 1001 Arabian Nights. Scheherazade became my hero the first time I heard her story, and I’ve loved every version since. Could stories save the kingdom? The world? I hope so! This wonderful Sufi tale is my mantra on difficult days. I first heard it as told by Doug Lipman, and it was my farewell story when I retired from teaching. This story is also known as “The Lute Player.” I learned it for my friend Susan’s wedding. The tiny bit of singing in it is only possible because of the “Singing for People Who’ve Been Asked Not To” class at COCA (Center of Creative Arts). I used to tell this story early in the school year to set a tone of cooperation for my classes. In the Chinese story the problem is very long chopsticks. A Spanish story remembered from high school, a favorite at the Renaissance Faire. Inspired by a John Steinbeck story, told with help from Brianna, Hannah, and Josiah. We absolutely love your cd! The music and nature sounds add a very nice touch! Well done! I really enjoyed your CD. Your voice is not pretentious, but is in the natural, conversational tone that makes good storytelling. I felt like I had sat with you for the time and just had a “talk.” Congratulations, you have a created a product to be proud of for a long time. •My former students for listening and commenting. One young man asked, “Are all your stories about women?” Not all, but I do love strong women stories and tell them often. Not only is feminism not a dirty word, but it’s also not new. There have always been strong and capable women, and thank goodness for that! Each CD Courage and Wisdom Frog & Friends is $10.00 U.S., and $2.00 for shipping and handling to anywhere in the continental U.S.; add $0.50 shipping for each additional CD. Dough Doughy and friends build a church, face a blizzard, enjoy life.